AIReal Yoga™ : Elevate, Exhilarate, Alleviate - Aireal Yoga | Take your yoga to a higher level through teacher training or bring AIReal Yoga to your studio. Have you hesitated to hop in the silks? Have no fear! AIReal Yoga , the leading aerial yoga provider and most trusted form of aerial yoga is at Telluride Yoga Festival to guide you in flight and into a deeper state of bliss. How does AIReal Yoga makes yoga accessible to everyone? 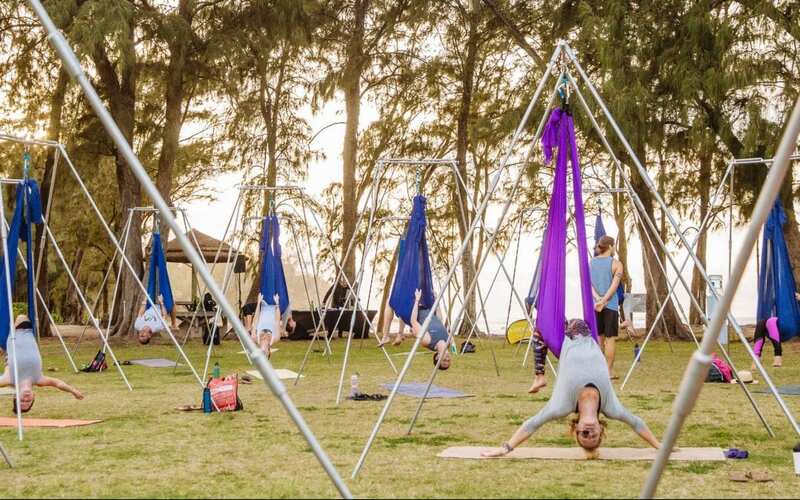 The aerial hammock is used as a prop (much like those blocks, blankets, and straps you see floating around the yoga studio) to promote alignment, refine postures, increase flexibility, expand range of motion, support weight, and safely progress into deeper expressions of standing and inverted postures. The hammock is a looped fabric hung from a swivel on a single point, offering support for the body, creating the dynamic between effort and ease promoting the mind-body connection. Check out Carmen’s AIReal Yoga Beginning Series to see how aerial yoga transitions your practice into the air and allows you to move freely. Make no mistake, AIReal Yoga is real yoga grounded in the traditions of Hatha Yoga. 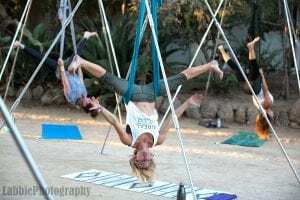 AIReal Yoga is the first aerial yoga program to be recognized by the Yoga Alliance and had to go through a rigorous evaluation to achieve that! All instructors are 200+ hour trained Yoga Instructors with foundational Hatha yoga knowledge. Through their AIReal Yoga intensive training, they are specifically taught to guide students through the traditional Hatha Yoga practice (think Plank, Up Dog, Down Dog; Warrior I, II, III; Crescent; Forward Folds; Dancer; Twists; Wheel; Rest/Savasana) using the hammock as a prop. Instructors ensure they queue specifically so students honor the limitations of their own mind & body. Check out Carmen’s well-rounded AIReal Yoga Class to see how the breath and traditional Hatha yoga postures are integrated into an aerial yoga practice. AIReal Yoga is yoga for ALL! AIReal Yoga compliments every yoga practice and meets you where you are. Whether you are a newcomer to yoga or well-practiced in the art of asana, practicing AIReal Yoga will assist you on your journey to deeper self-healing. As yoga students, we are in a constant state of exploration and discovery. The AIReal Yoga hammock allows you to safely access new postures, explore new space, expand your practice, and safely push past perceived limitations. Students feel confident using the hammock for support and dare to dive deeper. Many even surprise themselves as they push past boundaries, build trust in themselves and the hammock, and do things that they may never have imagined possible. For experienced practitioners, this is an opportunity to restore and renew your mat practice. For newcomers, AIReal Yoga offers the opportunity to experience a range of asanas in the most physically supportive way. AIReal Yoga is REAL yoga, not circus. The postures are based off yoga teaching lineage passed down from yoga’s traditions, philosophy, and history. We save the flips and tricks for acrobats in the circus! The hammock is a prop to be used with yoga asanas and postures. It was designed for all levels and styles of yoga, from gentle therapeutic to power or vinyasa flow. AIReal Yoga is ideal for every level. Intro to aerial yoga classes are designed to provide the foundation you need to begin a yoga practice on the mat and in the air. With 40+ Affiliate Studios and 200+ Trained AIReal Yoga Teachers, AIReal Yoga classes are offered at studios and festivals nationwide. All body sizes, ages, physical conditions, and experience levels are welcome! AIReal Yoga promotes a pain free body. Alleviate common aches & pains, promote healing, and and prevent injury through the physical benefits of yoga. The hammock is a prop you can hold for balance, use as a spotting device, and create traction. It makes poses accessible by promoting balance in the physical body, encouraging weaker muscles to strengthen, lengthening tight/inflexible areas, expanding range of motion, providing traction, and supporting your weight. Yoga teaches healthy breathing techniques. Yoga helps develop a nourishing breath that calms the mind and fuels the muscles. Using the hammock as a supportive prop helps take the focus off the struggle of the asana or perfection of form and turns your attention to the cadence of the breath, often calming the distractions of the mind. The hammock helps you find peace instead of worry. Face your fears and conquer them! Postures such as inversions and backbends can feel terrifying. 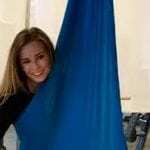 Using the hammock as a prop to safely enter into and out of them helps build confidence in yourself, awareness of your strength and ability, and ultimately helps you overcome the fear of falling. In addition, with each asana, there are a variety of supporting or “build” postures to find your center, teach proper alignment, create stability, and eventually perform the posture without the aid of a prop. Ready to soar? Then, it is time to fly! 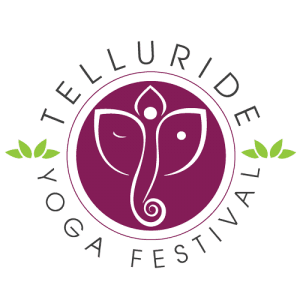 Check out the Telluride Yoga Festival Class Schedule and sign up for an AIReal Yoga class. These specialty classes are limited and fill up fast. Don’t hesitate! Get your yoga high on with us here at Telluride Mountain! AIReal Yoga offers an array of opportunities to join our Tribe and continue your life-long journey with us! Teacher Trainings, Continuing Education, Workshops, and Immersions are offered throughout the year in destinations worldwide. Studio Licensing equips Partner Studios with Hammocks & Gear to offer AIReal Yoga in their local communities. Plus, we just launched our AIReal Yoga Affiliate Program to continue to provide you the tools & resources you need to soar as a yoga instructor and entrepreneur. Blog post co-written by Shelby Nichols and Jenna Cassidy. Both Shelby and Jenna are certified AIReal Yoga Instructors. In addition to teaching AIReal Yoga, Shelby managed the social media for AIReal Yoga. Learn More about Shelby Nichols. In addition to teaching AIReal Yoga, Jenna serves as the Vice President of Business Development for AIReal Yoga. Jenna also teaches myriad forms of yoga, Ginastica Natural, martial arts, and women’s self defense and is an IN Health Coach. Learn More about Jenna Cassidy.